If you are someone who lives by the motto “it’s better to be safe than sorry”, then an emergency road kit is an absolute must for you. However, actually choosing which kit to keep in your car is probably a little bit more difficult than you may have anticipated. For one thing, there are a lot of choices out there and many of them appear to be identical to one another. Secondly, it can also be tough to look past all of the jargon to figure out whether or not the kit is actually worth your money. So, to make sure that you don’t walk away with a dud, we took a look at the various kits on the market to see which ones stood out as the best emergency road kits. Efficacy: First and foremost, we considered whether the items present in the kit would actually be useful in an emergency situation. It isn’t enough to have a kit that has a large number of items, tools, or pieces. These components should be useful for a variety of situations, particularly if there aren’t other forms of assistance available. Quality: Since you will most likely be using these items in an emergency situation, we needed to know that they were constructed from high-quality materials and that they were built well. This is the only real way to determine whether or not the items and the kit would hold up under extreme circumstances. Transportability: We looked at how easy it was to keep this kit in your car – for instance, was it easy to store or did it take up too much space? We also analyzed how each of the items was arranged inside the kit to see if you could easily sort through and find the tools when you needed them. Usability: Another major focal point of today’s battery chargers is making them as easy to use as possible. Not every user has the time or the interest to learn the workings of batteries and their chargers. So manufacturers have gone to greater length to make their chargers efficient easy to use. 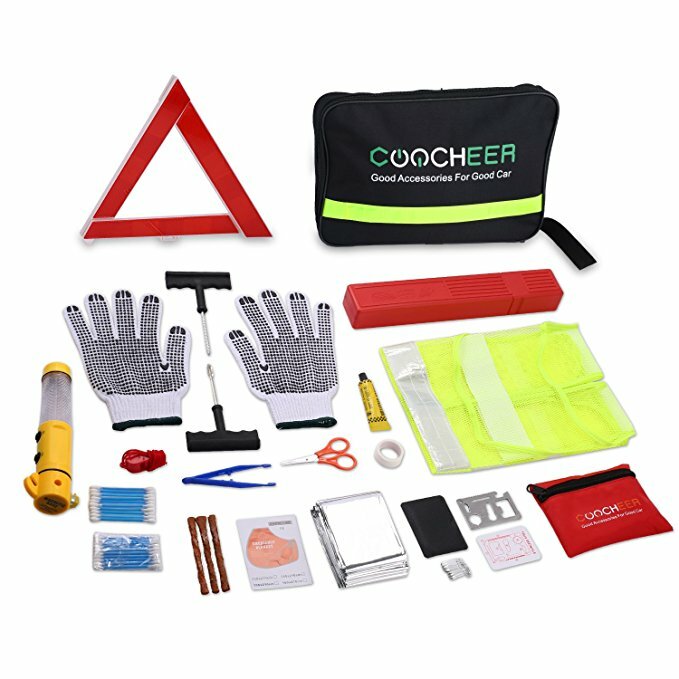 Why we like it: The COOCHER Auto Emergency Kit is a good option for a variety of drivers facing various emergency situations. What’s great about this emergency kit is that it is a very versatile option. 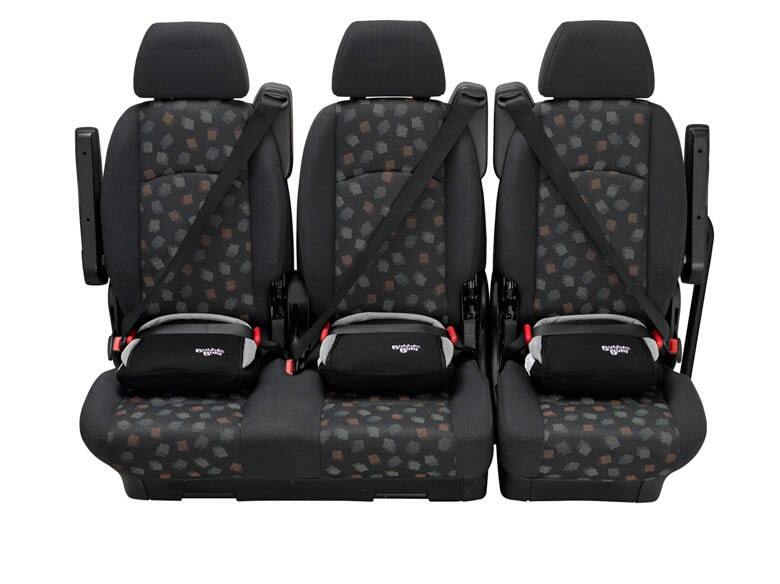 It is a good fit for those that are handy with tools as well as drivers who are just looking for the basic components. As such, it works well for a variety of situations. In this kit, you get all of the necessary items like jumper cables, screwdrivers, fuses, bungee cord, electrical tape, fuel pump, and a flashlight. There are also tools like the seatbelt cutter/safety hammer that will help you get a tricky situation. Last but not least, the kit contains a reflective vest, reflective triangle, and gloves to ensure your safety. The only minor issue with this kit is that the flashlight has a tendency to overheat and stop working after a while. While the first aid kit for this emergency set is rather basic, it does have everything you need to take care of most minor cuts and scrapes. There are plastic tweezers, scissors, a multi-functional blade, cotton swabs, surgical tape, and safety pins. There is also an emergency blanket. 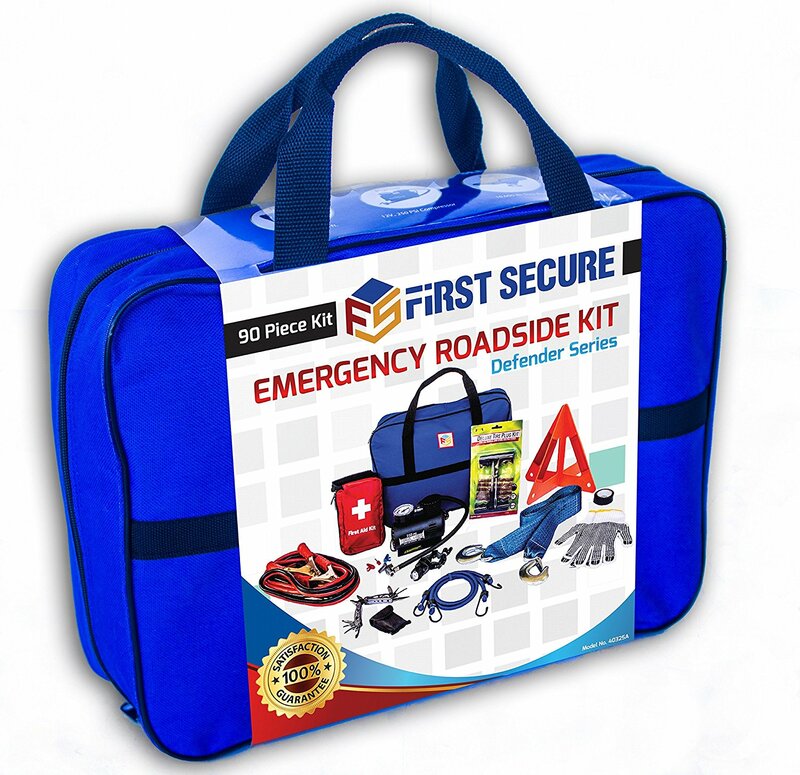 One of the items that make this emergency kit stand out is the inclusion of a tire repair kit. This means that in addition to the tire pressure gauge, you are also provided with tools that can help to fix a tire that is leaking air. This should have you back on the road without requiring any assistance. Why we like it: The First Secure Roadside Emergency Car Kit is a full-service set, ensuring that you will be able to tackle most emergency situations by yourself. 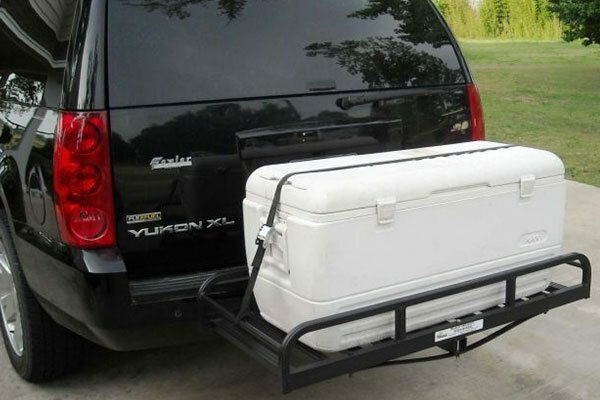 There is no denying that this is certainly one of the more practical car kits on this list. This is because it is equipped with lots of heavy duty tools and items. So, you can be quite sure that you will be prepared to deal with most minor emergency situations. Now, you do get the essential items like jumper cables, 9-piece multi-tool, cable ties, electrical tape, bungee cords, and a headlamp. At the same time, the kit also contains a tow rope with a 10,000lb capacity, meaning that you can easily get a tow from a passing Good Samaritan if you needed one. There are also several other useful items such as reflective triangle, work gloves, and a tool that doubles as a seatbelt cutter and a glass breaker. The kit doesn’t, however, have a reflective vest and the triangle is a bit flimsy. Another one of the perks of this roadside kit is the fact that you get a fully stocked first aid kit. You will find alcohol pads, sponges and swabs, different kinds of bandages, medical tape, safety pins, and scissors. All of these things mean that you should be able to effectively treat most minor wounds and injuries. This kit does actually come with a few additional features. To start with, there is a tire repair kit that allows you to repair your tire if there is a hole in it. However, this kit kicks it up a notch with the tire pressure gauge. So, once you have fixed up your tire, you can actually pump it up so that it is at a safe level for you to drive on. 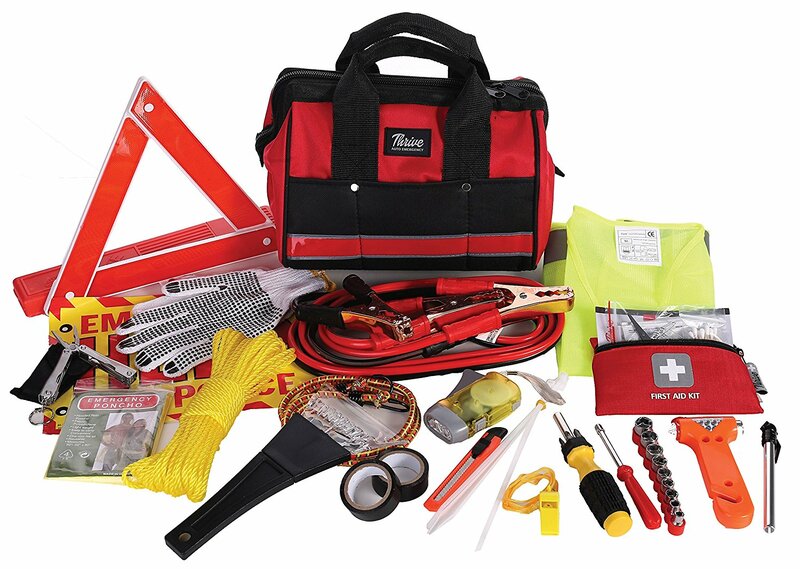 Why we like it: The Kolo Sports Premium Auto Emergency Kit contains a wide variety of emergency tools and items, suitable for most situations. 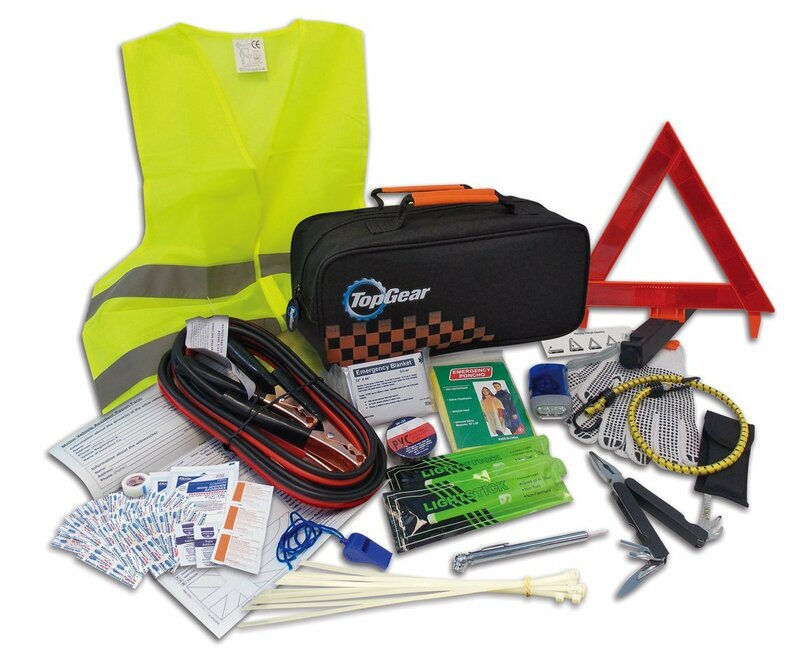 This is the perfect emergency kit for anyone who has some knowledge regarding auto repairs. If you know what you are doing, this kit has many tools that you will need to fix your car up, at least temporarily. Many of them are as you would expect – light sticks, self-powered flashlight, tire pressure gauge, jumper ropes, bungee cords, cable ties, gloves, and PVC tape. Then, there are the items that will help you get out of a tight spot including a glass breaker/seatbelt cutter and a tow rope. At the same time, this kit contains a considerable number of tools you can use to repair your car. 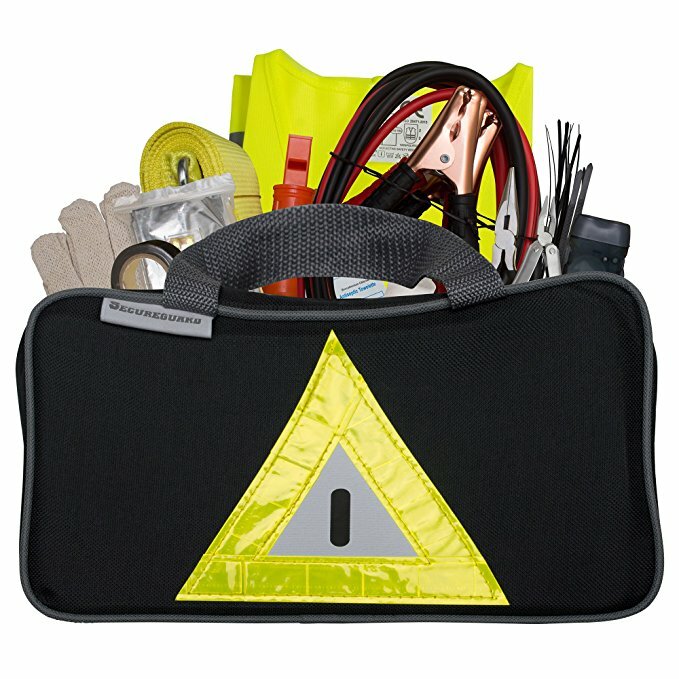 Since you will need to stay safe while you are working on your car on the roadside, the kit also contains a reflective vest and a reflective triangle. There are an emergency blanket and poncho as well. Now, the first aid kit is rather basic. So, in a pinch, you will be able to use it for minor cuts, bruises, and abrasions. In this kit, you will find alcohol pads, adhesive bandages, gauze, and first aid tape. These items, alone, may prove to be too simplistic for many. Car-savvy users are really going to enjoy this kit. This is because you get a toolkit along with the rest of the items. Now, this toolkit contains a variety of various screwdrivers – including one with a changeable head. You also get pliers and a box cutter in the toolkit as well. Then, there is the adjustable wrench that will also come in handy when you are trying to work on temporary repairs. 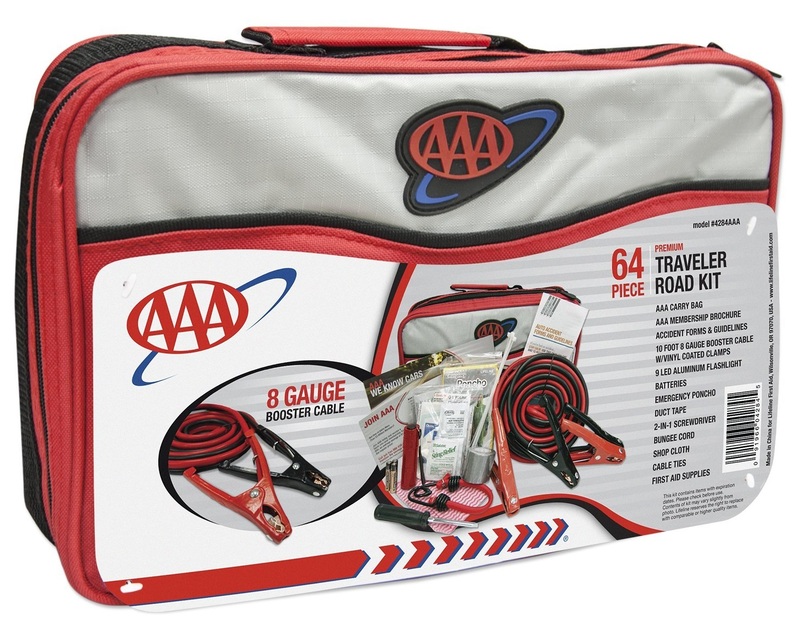 Why we like it: The Always Prepared Roadside Assistance Auto Emergency Kit is a compact set that contains all that you need to deal with auto emergencies. What is so useful about this particular kit is that it contains a wide variety of items and tools. As a result, you can be quite sure that regardless of what the emergency problem is, you will be able to deal with it. So, if you want to be prepared for almost anything, this is a good kit to have around. First off, there are some of the more rudimentary items. These include a self-powered flashlight, light sticks, jumper cables, bungee cords, gloves with extreme grippers, cable ties, tire pressure gauge, and PVC tape. The minor inconvenience here is that the tire gauge is a bit flimsy and doesn’t function too well. The kit has slightly more advanced options as well as a 3-ton tow rope and a multi-functional tool. This tool can function as a blade, screwdriver, bottle opener, pliers, saw blade, and more. For safety purposes, the kit is equipped with a seatbelt cutter/glass breaker tool, a safety vest, and a reflective triangle. 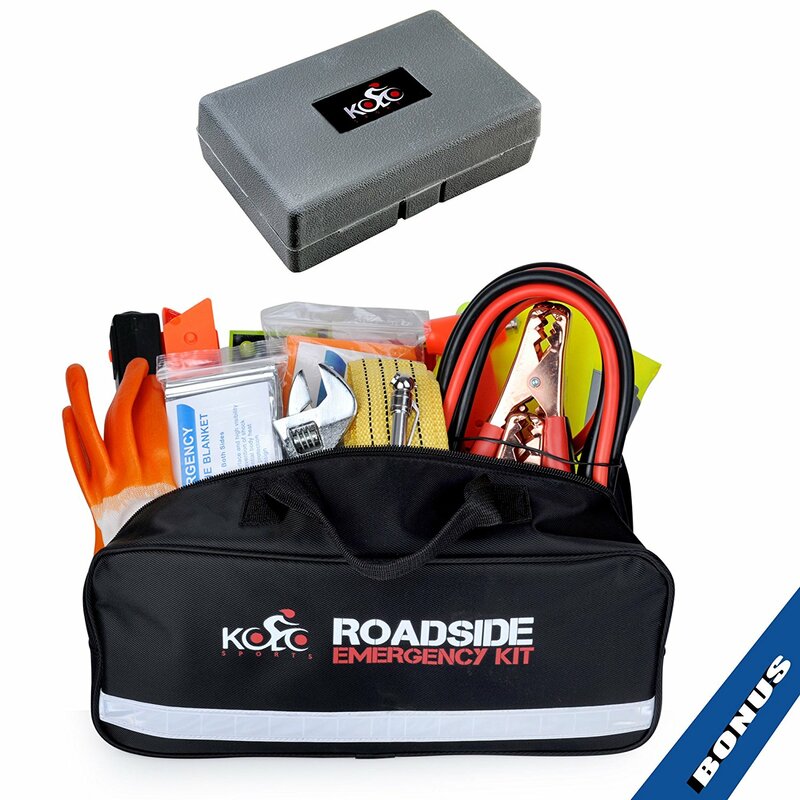 One of the things that really stand out about this road kit is the first aid set. This is because it is fully stocked and contains most of what you need. So, you will find a variety of bandages, alcohol prep pads, iodine pads, antiseptic towelettes, bandages, Q-tips, and gauze pads. What’s more, it contains single use medicinal packs as well. So, there are medications like ibuprofen, creams for various wounds, and even an insect sting relief providing lotion. You will be able to tend to wounds more efficiently with this kit. While there aren’t really additional features or items per se, this road kit is equipped with its own accident report form. This way, you can get all of the relevant information down, right at the scene and have an accurate recording of what happened. Why we like it: The Top Gear Premium Roadside Assistance Kit is a basic collection of tools and items that work well for many minor road emergencies. The first thing that you should realize about this kit is that it doesn’t come with any bells and whistles. As such, it is a good set for minor roadside emergencies. For example, if your battery were dead or you wanted to conduct minor repairs. When it comes to anything else, though, this kit may simply not be able to manage it. With this kit, you get the essentials like jumper cables, light sticks, hand squeeze flashlight, gloves, cable ties, bungee cord, tire pressure gauge, and PVC tape. It also includes a multi-functional tool that can be used for small repairs or a similar task. Unfortunately, there isn’t a seatbelt cutter or glass breaker in the kit. There are, however, some items to help keep you safe and comfortable if you are stranded. The set contains a poncho, an emergency wrap, safety vest, and a reflective triangle. As an added bonus, all of the tools and items in this kit are high-quality and likely to last you a long time. The first aid kit is actually quite good. It contains adhesive bandages, gauze pads, cleansing wipes, antibiotic ointment, and tape. This is enough to help you clean up most minor cuts and bruises and to create a bandage as well. This particular emergency road kit doesn’t actually have any additional items. It does, however, have an accident report form at the ready. So, regardless of the issue, you can quickly jot down some notes so that you can provide your side of the story before you forget any details. The kit is also a bit of a treat for Top Gear fans. This is because the case is emblazoned with the logo and many fans enjoy carrying around a piece of their favorite TV show. Why we like it: The Thrive Roadside Assistance Auto Emergency Kit is a good choice for anyone who wants as many emergency items as possible. If you are someone who likes to cover all of their bases, then this kit will surely appeal to you. This is because it really does appear to have everything that you could want when you are in an emergency situation. So, you should be able to take care of yourself quite well until help arrives. The kit has all of the bare necessities that you will require. This includes jumper cables, rope, bungee cord, flashlight, electrical tape, zip ties, knife, and tire pressure gauge. With these, you should be able to handle most minor problems. You also get a glass breaker/seatbelt cutter, poncho, reflective vest, reflective triangle, and gloves to help keep you safe and comfortable while you are stranded. What’s great about this kit is that it also includes an ice scraper, which makes it suitable for dealing with even the coldest conditions. The only real issue with this kit is that all of the items can easily get tangled in the bag, making it difficult to get to them when needed. The first aid kit provides you with everything you will need to deal with most small injuries or wounds. There are adhesive bandages, tape, cotton pads, alcohol pads, antiseptic cleaning wipes, tweezers, and scissors. It even comes with a first aid booklet that provides you with relevant information on how to deal with most minor wounds. One of the truly useful additional features in this kit is the variety of tools. There are various screwdrivers and pliers which come in handy if you want to attempt small repairs. So, if you know what you are doing, you may be equipped to get yourself out of your own emergency situation. There is also an accident report form to make any notes that you may want to. Why we like it: The CARTMAN Roadside Assistance Auto Emergency Kit is ideal for anyone who is looking for an emergency kit that only contains the essentials. If you only want an emergency kit that contains only what you will need in a minor emergency situation, then this is the kit for you. While this may seem like a disadvantage to some, it also ensures that this kit is lightweight, easily stored in your car, and most importantly, hassle-free. 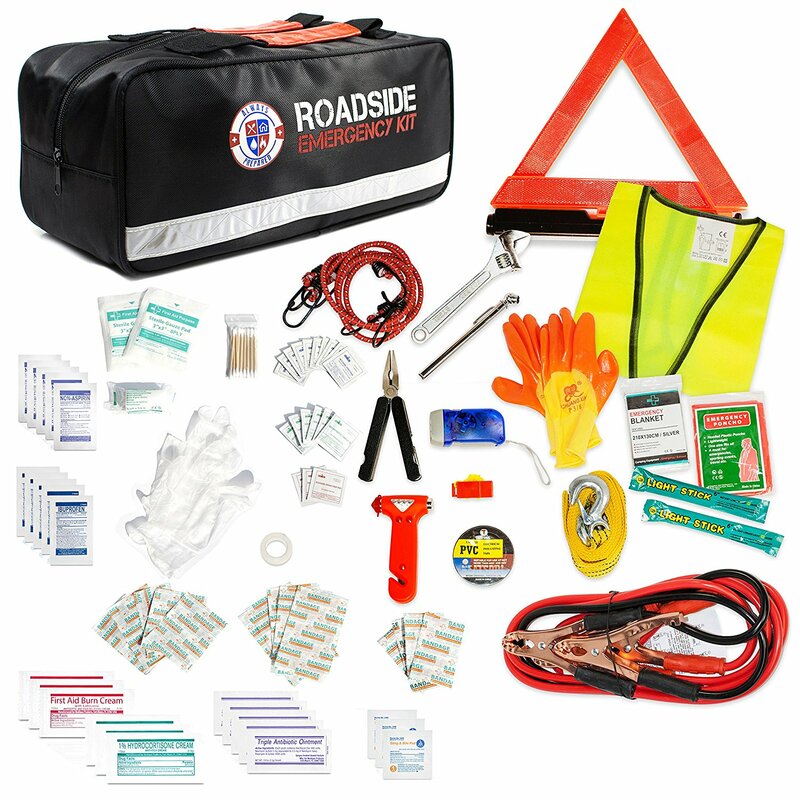 While this roadside kit may not have all the bells and whistles, it still contains the items that can be considered essentials. For instance, it has jumper cables, a durable tow rope that is able to handle up to 4500lbs, and gloves. With these, you can jumpstart your car or get a tow, making it a good solution for minor emergency situations. You can also be quite certain of your safety with this kit around. There is a bright reflective vest and triangle to alert passing motorists of where you are stranded. There is also an emergency blanket and a poncho to protect you from the elements. The most unfortunate thing about this road kit is that it doesn’t have a first aid kit. This means that you will either have to include your own items in the case or carry a separate kit entirely. As mentioned, this is a pretty basic kit, so there really aren’t any additional items or features to look forward to. Still, it is important to know that the components in this kit are quite durable. For one thing, the material on the jumper cables ensures that it can survive incredibly cold temperatures and still work well. 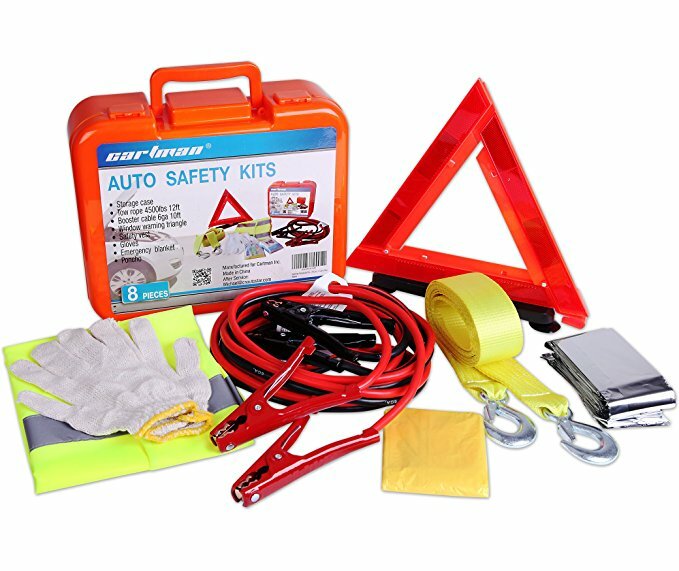 Why we like it: The Secureguard Roadside Emergency Kit is a good choice for anyone who has auto experience and needs the right tools to repair their car. 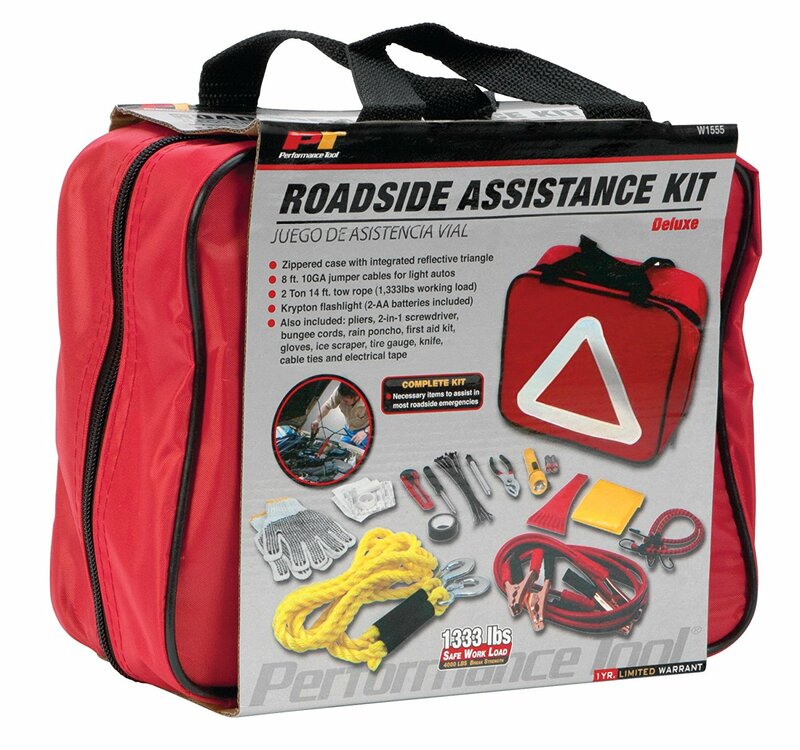 If you know your way around a car and don’t really need a roadside assistance service to show up, then this kit can actually be very useful for you. It has tools and other items that can help you sort out a variety of issues by yourself. First, there are the items that you would typically expect in an emergency kit. The kit includes jumper cables, a flashlight, and a 10,000lbs capacity tow rope. There is also a number of tools such as wrenches and pliers that can help with a variety of small tasks. If you are trying to stay safe out there while you are attempting to fix what is wrong with your car, then you can do this with the reflective vest and triangle included. There is also a poncho to protect you from the rain. If you are lost, the compass in the kit may be able to help you out. The main flaw in this road kit is that the components are made from materials that are of great quality. Due to this, it can be difficult to determine just how durable the items will be in the future. Now, the first aid kit isn’t too fancy but it does contain all that you need. There are adhesive bandages, non-adhesive sterile pads, cotton pads, gauze, antiseptic wipes, and tape. With these items, you will have no trouble taping up small wounds or injuries. As mentioned, this is a good kit for someone with more experience. This is because it is equipped with reinforced wire connectors, electric current detector, and replacement fuses. So, you should be able to tackle minor electrical car issues with these items. The great thing about this kit is that it comes directly from the AAA so you can be sure that the components are going to be high-quality. Still, you should be aware that it still only contains the most essential items so you can’t exactly do many repairs. For the most part, it contains all of the components that you will need. 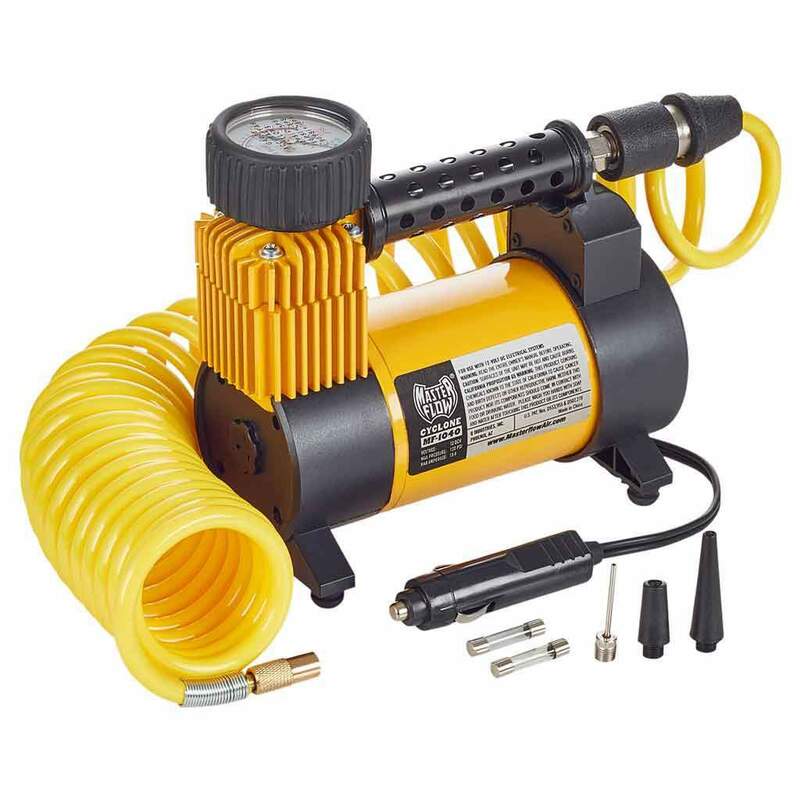 This includes the heavy-duty jumper cables, flashlight, cable ties, bungee cord, and duct tape. There is also a 2-in-1 screwdriver if you want to give minor repairs a shot. What is lacking in this kit, however, are the safety components. For instance, there are absolutely no reflective gear or items at all. This means that at night, it will be quite difficult to make your presence known to motorists who are passing by. Fortunately, there is a poncho to protect you from the rain, though. The first aid kit isn’t all that much to write home about either. While it has a lot of adhesive bandages, there are only a few antiseptic pads and one gauze pad. It does contain a sting relief pad and an adhesive roll, however. There is also a first aid guidance booklet that can be used to provide you with some insight on how to treat certain injuries. This kit contains accident forms that allow you to take notes of anything that may have occurred, leading up to the accident. What is just as helpful is a booklet with guidelines on what to do. So, if you are unsure of the procedures, these guidelines will certainly help. Why we like it: The Performance Tool Deluxe contains the basic tools and items you will need to help yourself out of an emergency situation. With this Performance Tool assistance kit, you should be able to take care of most of the minor emergencies that you will encounter. To help you out, you have bungee cords, jumper cables, cable ties, flashlight, pencil tire gauge, a tow rope, and pliers. So, if you want to be able to tow your car to another point or you want to jumpstart the battery, then you will be able to do this with ease. What’s more, you can even check your tire pressure to determine what the problem is. The great thing about this kit is that you don’t need any specialized skills to use – it is all pretty self-explanatory. This kit is also effective for most scenarios. For instance, if you are stranded in the dark, the reflective triangle will work to alert others to your position. On the other hand, if you get stuck on the roadside in the winter, the ice scraper and the rain poncho can help. The real issue with these items is the quality. It is not the best and you may find that many items are simply not durable enough. As far as the first aid kit goes, the contents of it are rather simple. You get some adhesive bandages, adhesive tape, and a few swabs. So, it isn’t something that you will be able to rely on except for small cuts and scrapes. Also, because there aren’t too many items, you will need to keep replenishing the supply quite often. Now, there aren’t really any additional features or items to talk about with this kit. It is quite basic, which can both be a plus point and a negative point as well. The whole point of an emergency road kit is that you keep it in your car at all times. This is part of the reason why it is important for it to be compact and not take up a lot of space. If the case is small, you are unlikely to take it out of your car to make room for other things. The other reason you should look for a smaller road kit is if you want to store in the front seat of your car. After all, to be able to use items like the seatbelt cutter, glass breaker, or other tools, you need to have easy access to them. Most road kits claim to have a considerable number of items. This is why it is not unusual to see kits that have upwards of a hundred pieces. Now, on paper that may sound impressive but it doesn’t actually mean much. See, when these manufacturers state these numbers, they are actually counting each individual component in the kit. This includes screwdriver heads, adhesive bandages, zip ties, and so on. In the end, you aren’t actually getting as many items as you imagined. What you need to do instead is to carefully go through all the items that are mentioned in the kit. If you want a full-service kit, pay attention to the different kinds of tools and items that it contains. This is the only way to make a proper decision concerning the usability of the kit. This brings us to the matter of what items should be in your kit. Now, for the most part, this is a personal decision. You need to look for items that make you feel safe and also help you get out of an emergency situation. That being said, there are some essential items that you really can’t do without. These include jumper cables, a seatbelt cutter/glass breaker, bungee cord, flashlight, and electrical tape. Items that can also be really helpful are tire pressure gauges and tire repair kits. Since these are rather common issues, it can be handy to have something like this in your car. Since there is a very real chance that you can get hurt while trying to start your car on the side of the road, it can be a good idea to have a reflective triangle or vest. At the very least, it works as an excellent signal, if you try to flag down help. Tow ropes, some kind of blade, ponchos, and emergency blankets will be quite useful as well. Now, emergency kits aren’t really complete without a first aid kit. However, you should know that no two kits are created the same. Some are rather basic and have little more than a few adhesive bandages and gauze. Others are slightly more advanced and have antiseptic and cleansing wipes as well. Of course, you should keep in mind that the first aid kits associated with emergency auto kits aren’t going to be all that impressive. So, if you really want a good one, you are probably going to have to choose a separate kit. 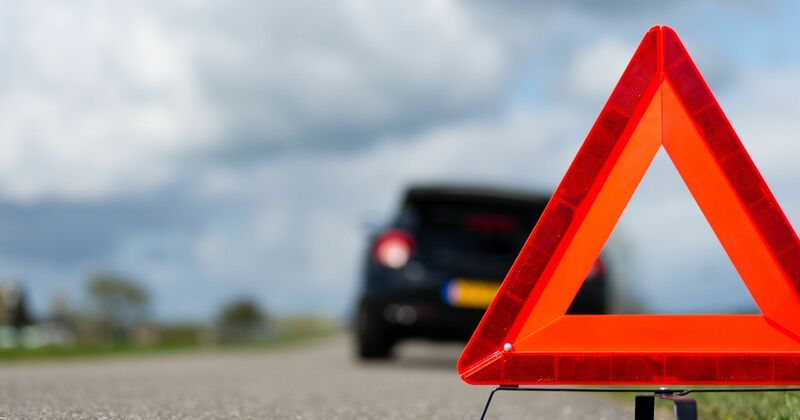 Since you are most likely only going to turn to your roadside kit during emergencies, you need to be confident that you can rely on them when needed. This is why you should look for high-quality items that you can be certain will withstand various conditions or survive being in a box for many years. They should also be durable so that when you finally use them, they work the way they are supposed to. Of course, the only real way to ensure this is to take the tools out every so often and test to see if they are working. This concludes all that you need to know about emergency road kits. Here we have mentioned the brands and kits that really stood out from the rest. Hopefully, you will also find our guide helpful enough should you decide to pick your own kit.